Cream the butter, sugar and lemon zest together until your mixture is nice and fluffy. Add the eggs, beating into the mixture. Add your flour and baking powder then stir into the mixture with a wooden spoon until the flour has all gone. It doesn't matter if your mixture is a little lumpy. Stir in the lemon extract and the milk, then continue to stir with your wooden spoon until you get a nice batter. 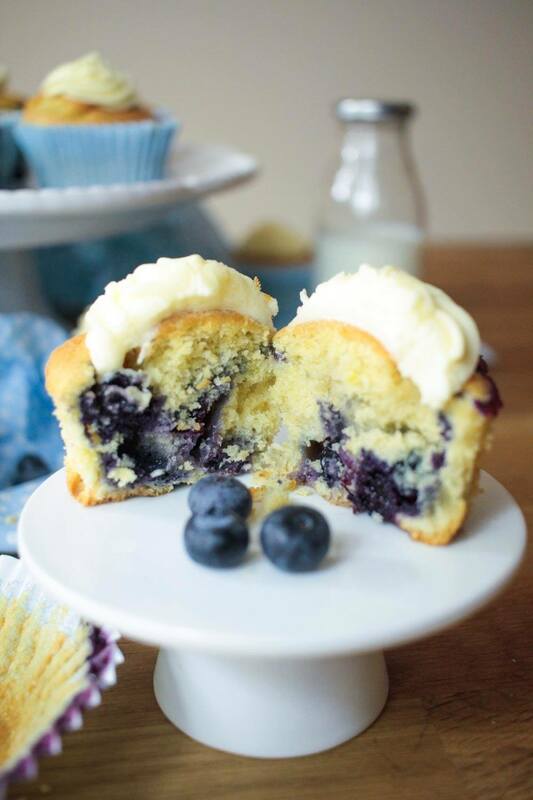 Add your blueberries to your batter and stir them in. Divide the mixture evenly into the cases and place in the oven for about 25 minutes or until they are nice and brown. Let your muffins cool down and prepare your frosting. Cream your margarine in your mixer for about 3-5 minutes. Sieve the icing sugar into the mixture and on a low speed whisk so it all comes together to a paste. Add your lemon extract, fresh lemon juice and your limoncello to the mixture. Stir well, loosening it up. Test your mixture, you can always add more limoncello if you wish. Just remember you don't want it to be too runny to pipe. If this does happen just add a little more icing sugar. Pick a nozzle and pipe a small amount of frosting into the centre of the muffin. Serve with a cuppa tea or why not have it with a shot of limoncello, you don't want to waste it!